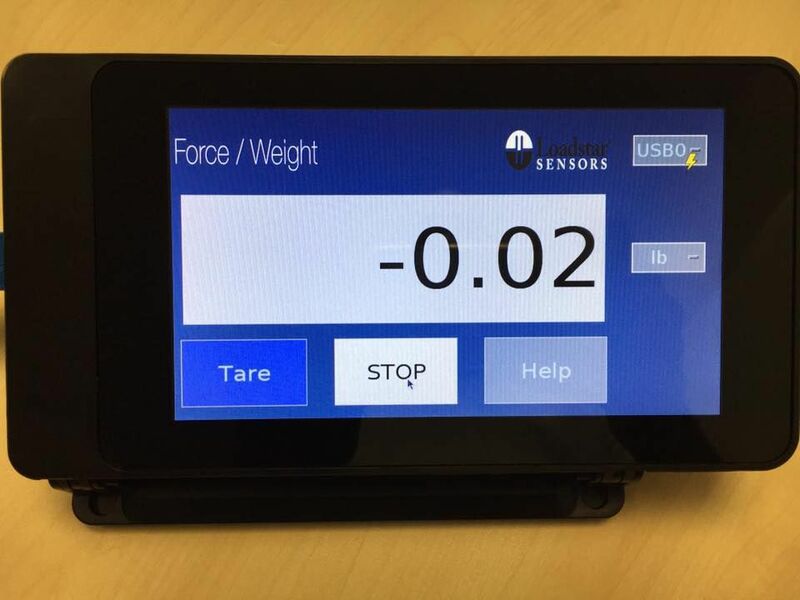 Loadstar Sensors offers a variety of digital load cells, weight sensors or weight scales with USB or Wireless output. The iLoad Series and the iLoad Series offer direct USB Output through out S2U UART to USB miniB to USB A adapters. The DI-100U/DI-1000U USB Load Cell Interfaces can be mated to any of our resistive load cells to obtain calibrated USB output. Although any Windows Tablet (e.g. Surface 3, Surface 4 or Surface Pro) or All-In-One PC can be used as a very effective and rich display with a GUI environment using our LV-1000/LV-4000/SensorVUE/ControlVUE software, a number of customers have asked us for a simple, dedicated Touch Screen LCD display for use in factory and laboratory settings where use of PCs may not be appropriate. In order to meet our customer requests, we have developed a display solution - the DS-3000 Pro - using a Raspberry Pi 3 (RPi3) controller and Touch Screen display as shown below. Our solution comes ready to use out of the box, all you need is to plug in the sensor and power our display using the provided power supply. Unlike our RD-1000 or other third party generic displays, this display DOES NOT need to be calibrated with a load cell. START: Writes "WC" command to sensor to begin data collection. Starts displaying weight values. TARE: Tares the sensor (CT0). Zeroes out initial weight/force before you can take readings relative that initial value. HELP: Opens Help file with some common errors and how to fix them. UNITS: Pick which units you want to display data in. Lbs, N, Kg, g.
PORT option menu: If you have multiple sensors connected, you can pick which one you want to display. ID: Shows sensor ID, so you know which sensor is selected. The display comes with an adjustable stand whose angle can be adjusted by gently moving it back and forth. It also comes with a 5V/1A power adapter with a Micro USB connector to power the device. To use the display, assuming sensor was connected before powering up the unit, just touch the Tare button first. Select units you want the information displayed in. And then touch the Start button. That's it! and the DS-3000 Pro BLE which works with the DI-1000BLE for wireless communication between the display and the load cell/interface. This unit also supports USB functionality and is compatible with the iLoad/iLoadTR/iLoadPro/iLoad Mini+DQ-1000U and any resistive load cell mated and calibrated with our DI-100U/DI-1000U interface devices.